Hind Yousef laughs heartily as she recounts using her degree in clinical psychology to diagnose herself with a “Type A personality.” She identifies with people who need a lot of structure and organization–yet she strikes me as someone who is immensely comfortable with chaos. After all, she works in Jordan providing mental health care to Syrian refugees fleeing this century’s bloodiest, most brutal war. Born in Jordan but raised in Texas, Hind returned to her home country a year and a half ago and began working with International Medical Corps as a Mental Health Psychologist. She fell in love with psychology in an introductory class at the University of Texas after noticing the profound effect it had on her own life. Before psychology, she says, she did not know how to “monitor herself.” Then she started using the breathing exercises and relaxation techniques she learned in class, and found that they calmed her when she felt upset—which in turn calmed those around her. “I found this ripple effect very interesting,” she says, and I picture her calm amidst what I can only imagine is persistent calamity. Through her work with International Medical Corps, Hind treats vulnerable Jordanians as well as refugees from Syria, Iraq, West Bank and Gaza, Yemen and Sudan. The job suits her, she says, as she has always had “the patience of listening to people” and “loves to help.” But her real gift, I believe, lies in her empathy. Many of the refugees with whom Hind works have endured or witnessed extreme violence. They have all been torn from their homes and separated from loved ones. Their symptoms manifest physically—in their racing hearts, sweating palms, loud voices—but Hind is a healer of intangible fear and trauma. How do you heal a wound you can’t see? I wonder. For Hind, this means moving through her clients’ fear with them. Makani Center in Mafraq, Jordan. 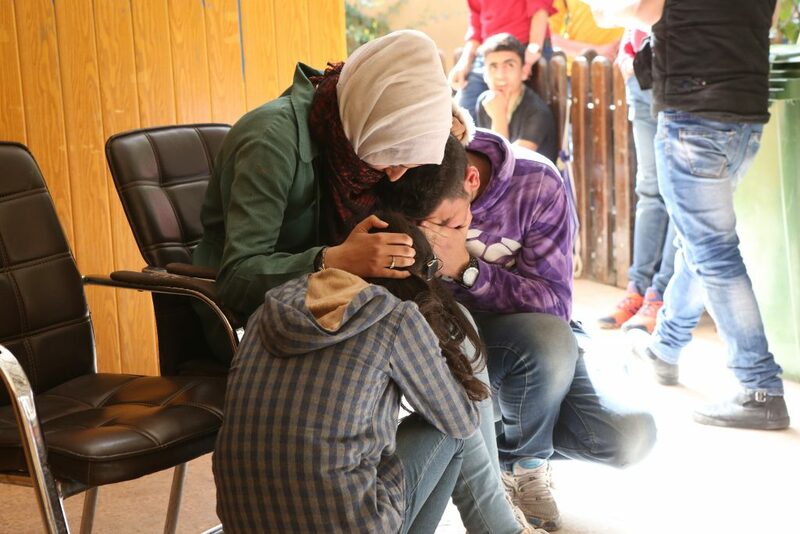 Syrian refugee kids stage a drama about stress & abuse resulting from the war and displacement. I think about how fear can root in us like a disease–we all experience it in our own ways—and how we must confront what haunts us to find peace on the other side of it. Hind has had to find equilibrium within herself to withstand the storm of emotions moving through her clients. Typically, her Type A personality keeps her mentally strong and disciplined, but other times she finds her heart “pierced” and must take refuge in a bathroom stall for a few moments. Then she takes a few deep breaths, counts to 10 and goes calmly back out into the world to continue healing others. Hind Yousef is a Mental Health Psychologist in International Medical Corps’ Jordan program, which aims to strengthen mental health care services for refugees and vulnerable Jordanians by integrating mental health into primary health care services. As a part of the STRENGTHS global project to implement and test the effectiveness of a scalable psychological intervention, Hind has been trained in the World Health Organization’s Problem Management Plus. Learn more about International Medical Corps’ mental health and psychosocial services (MHPSS) within complex emergencies here.